Thanks to all who are looking through the science papers and stories they’ve enjoyed in the last year to find the best. Among them is a very recent paper by a group of Scandinavian researchers and published in the International Journal of Sports Physiology and Performance, a journal focusing on how elite athletes can be become, well, even more elite. The next award nomination involves a switch from body to mind. It’s a fascinating investigation into whether cyclsts who wear helmets compensate for the enhanced safety by taking greater risks. 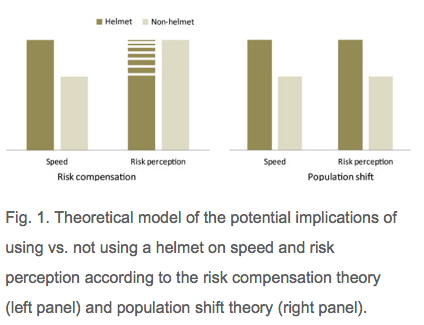 Apart from this novel approach to studying the effectiveness of laws that make wearing helmets compulsory, the paper is accompanied by some attrractive and informatve graphics. Indeed, the enduring cycle campaign group Spokes, in Edinburgh and Lothian, Scotland, used the conclusions from the paper in its submission to the inquiry of the All Party Parliamentary Cycling Group in Westminster UK earlier this year. The final of our early nominations indicates the breadth of reading of cycling science readers. “The Bar Sinister: Does Handlebar Level Damage the Pelvic Floor in Female Cyclists?” is a paper that went viral after it was published in the Journal of Sexual Medicine in March 2012. No doubt it gained such popular interest because it analyses a problem that is relevant to at least half of the world’s population that has ever sat on a bicycle saddle. And it pulls no punches. That’s the lot for this posting. There’ll be more soon. This entry was posted on 21/12/2012 at 5:39 pm and is filed under Awards 2012. You can follow any responses to this entry through the RSS 2.0 feed. You can leave a response, or trackback from your own site.